Five United Nations agencies, known as UNH4+ (UNAIDS, UNFPA, UNICEF, UN Women and WHO) and the Federal Ministry of Health signed an agreement with the Government of Sweden (through the Swedish International Development Agency – Sida) on the work plan for a joint project on reproductive, maternal, newborn and child health in Ethiopia, 2013-2015. 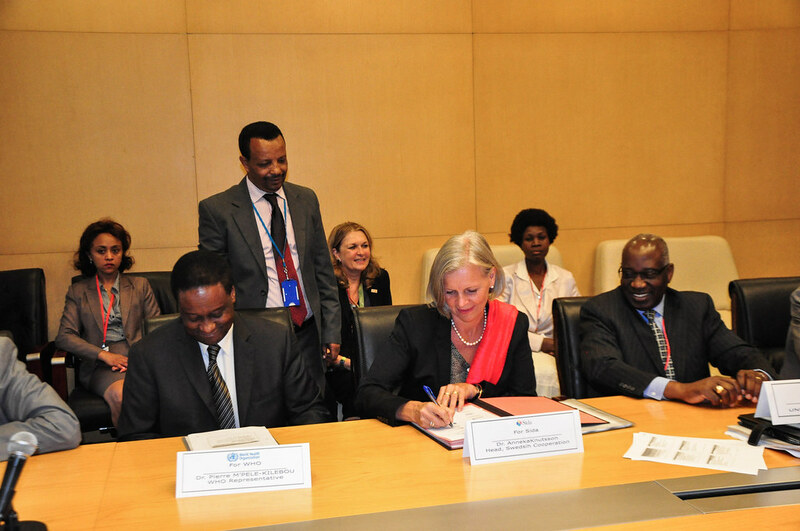 The signing ceremony took place in the presence of Hon Dr Kesetebirhan Admasu, Ethiopian Minister of Health, at the African Union Conference Center during the historic International Conference on Family Planning. Speaking at the signing ceremony, Dr Kesetebirhan appreciated the support of development partners in the Government’s efforts to reduce maternal and newborn mortality. He further expressed his satisfaction at how the partnership is supporting the Government’s initiative, with the Government in the driving seat. “With such country ownership and continued support of partners, the achievement of MDG 5 is not out of reach,” he underscored. 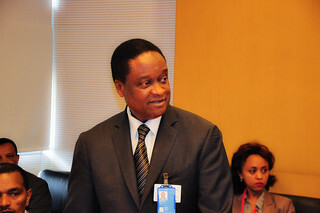 In its endeavor to maximize the impact of its support to the Government of Ethiopia, the United Nations Country Team (UNCT) is working with the principle of Delivering as One and strengthening joint efforts of the UN agencies in advancing priority areas within the development agenda. 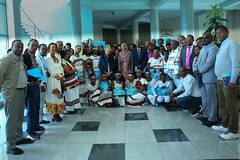 Both the Government of Ethiopia and the UNCT recognize maternal and newborn health as one of the top priority areas that require the concerted efforts of all stakeholders in the few years remaining of the MDGs. This work plan for the Sida/H4+ grant contributes to filling gaps in the current joint efforts by UN agencies in supporting the FMOH for implementation of the National Road Map for Accelerating Reduction of Maternal and Newborn Mortality and Morbidity, and thereby pave the way for Ethiopia to meet MDG 5 of by 2015, reducing maternal mortality ratio and increasing access to reproductive health. 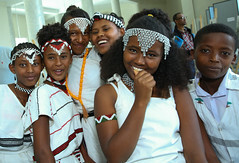 This blog post is extracted from World Health Organization Ethiopia Country Office media release. 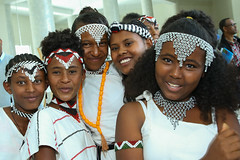 International Day of Disaster Risk Reduction was marked in Ethiopia with the theme “including persons with disabilities in disaster reduction” on the 11 October 2013. Commemorating the day an event which was organized by the Disaster Risk Management and Food Security Sector (DRMFSS), the Ministry of Agriculture and partner organizations, discussed relevant policy and legal frameworks, approaches, as well as good practices related with disaster and disability. 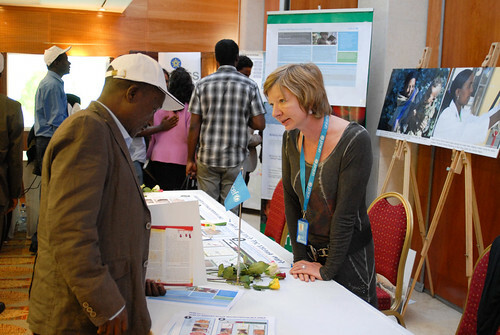 As a side event was an exhibition in which UNICEF and other partners participated. UNICEF took the opportunity to showcase the role of its nutrition programme in reducing disaster risks. UNICEF promotes and protects the nutritional status of children and mothers in emergency prone country such as Ethiopia to ensure better resilience and faster recovery.